Last week, some good friends generously treated DH and I to a double date at an intriguing restaurant north of Seattle called the Grouchy Chef. It was a totally unique and new dining experience for me because never have I seen one man run an entire restaurant. And by one man, I mean in addition to being the chef, sous-chef, and pastry chef, he was the host, the waiter, the cashier, and the busboy. Everything was absolutely a one-man show. And this wasn’t a food truck or a small food stand by any means. The restaurant had a proper sit down dining area with nice crystal and china, and could seat around 15-20 people at once. Not this guy though. Chef Masumoto is the sole owner/employee of the Grouchy Chef, but I don’t think he was actually grouchy. I suspect he probably has a severe case of OCD or germophobia (plastic on everything, don’t wipe your mouth on the cloth napkins but the paper ones, no lipstick, and use the bathroom when you need to blow your nose.) But despite this, he still wants to prepare good food for people. He supports worthy causes. In lieu of gratuity, he encourages customers to donate to cancer research, and he will feed veterans for free. I found out later that Chef Masumoto used to operate the Grouchy Chef in a strip mall, but too many people would just randomly walk in without a reservation. And so he moved to a quieter industrial location where he’s better able to serve a terrific dinner for a reasonable price by reservation only. If you’re just one person running an entire restaurant, I can understand how you have to be organized, efficient, and well planned. The whole operation has to be a fine-tuned formula, hence no compromising on customer requests by order. Doing so would result in a logistical nightmare for this one-man show. The dinner was excellent. As we were leaving, I peered into the open kitchen and there was Chef Masumoto, the lone person under the fluorescent lights, working away clearing up and prepping for the next day. He’s open for dinner seven days a week. I’m guessing the Grouchy Chef probably knows he can’t work with anyone else, and so he doesn’t have any employees to manage. He must have some crazy, unquenchable internal drive because running a restaurant is really hard work. But running a restaurant and doing everything on your own and from scratch seven days a week must border on total exhaustion. I can’t think of a good reason why he continues to slave away with such passion, other than he must really have a love for it. The Grouchy Chef experience isn’t for everyone. Those of you who expect and pay a high premium for outstanding service and ambience when you dine out (and who are bad at following directions) probably won’t enjoy it. But the fact that one person is serving you a four-course meal for about $25 is nothing to be grouchy about. The Grouchy Chef is good at what he does, but he will never be very popular. In fact, being popular would pretty much kill his niche business, as he’d have to expand, hire and manage staff, raise prices, and likely compromise considerably on the absolute and total control he has over his current business. After dinner we went back to our friends’ home nearby to chat and digest for a bit. We continued our conversation on all sorts of topics from creative thinking to how to source and organize good and useful information. Upon leaving for the evening, this very generous couple lent us their copy of Scott Berkun’s latest book, Mindfire: Big Ideas for Curious Minds. 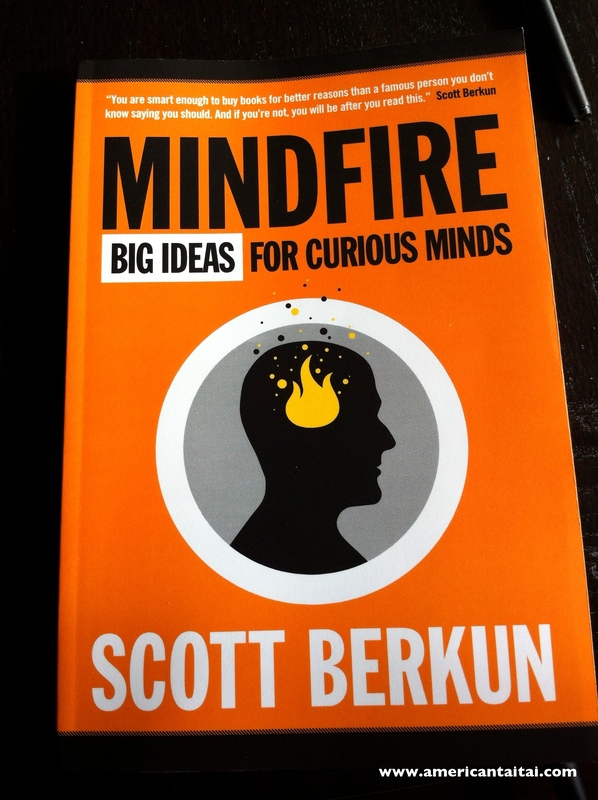 I hadn’t heard of Scott Berkun, the best-selling author of The Myths of Innovation and Confessions of a Public Speaker. Berkun is also a prolific blogger and public speaker, and I didn’t know he lives in Seattle. The temptation many creative people I know have is to strive for popularity. To make, do, and say things that other people like in the hopes of pleasing them. This motivation is nice. And sometimes the end result is good. But often what happens in trying so hard to please other people, especially many other people, the result is mediocre. Their internal goodness detector is disappointed with what they make. And worse, sometimes the results are awful. Popularity often comes at a price: going for bland, crass, predictable and meaningless, instead of interesting, delicate, complex and meaningful. But what most creative people want, all the ones I know, is to be both good and popular. They want to achieve their own sense of goodness, while at the same time pleasing other people. It’s a tightrope. Especially once you’ve been popular here or there, people tend to want more of the same. And that rarely fits in with a creative person’s sense of goodness. What do you think? All I can say is that last Friday, my mind and stomach were set alight, and I’m grasping at trying to make some sense of it. Very interesting article and dining experience. We’ll have to go there with you next time (hopefully, there is stuff we can eat since the iron chef says no substitution). I don’t think there are only two types – like many other things, people fall into different bands of a spectrum. Yes, I think you guys would really enjoy Grouchy Chef! As for the categories, I agree, though I guess I’m kind of implying that much of what is currently “popular” isn’t necessarily “good” but rather mediocre. There are exceptions of course! I think it’s more important to be good than to be popular, but at some point, being popular is also critical in getting things done and accepted, so it’s a really hard balance. I love the Grouchy Chef, though I was always nervous about whether or not I was thoroughly following all of his instructions. Hahaha! Yes, totally agree. I’ve heard a few people who’ve been so nervous during the dining experience that they later experienced indigestion! It wasn’t too bad though. No toasting w/the crystal goblets!!! I did have a hard time not wiping with the cloth napkin, so I just put the paper napkin in my lap over the cloth one and used that! Thanks for stopping by! this guy sounds fun! will have to check it out! thanks for the rec! It was fun, though a little disconcerting when he looked at me and pointed his finger saying “NO LIPSTICK!”… when I didn’t have any on. Otherwise, a really fun and interesting evening! You guys should check it out! What an interesting and thought provoking post! First of all, I LOVE the soup nazi!!! And the grouchy chef sounds very unique. I once ran a little coffee shop with friends, and it was so much work even after hiring a couple of waiters. I cannot begin to imagine how this guy is swinging it by his own. 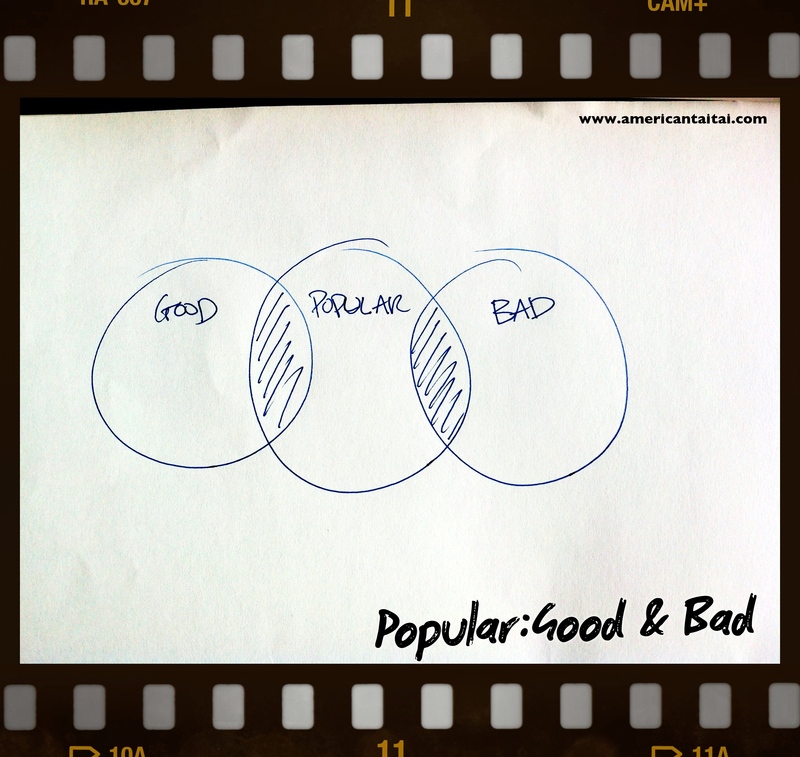 When it comes to “good vs. popular”, I agree, one doesn’t presuppose the other (sadly). That’s why there are so many starving artists, I guess. But it takes a lot of strength to stick with what you are convinced is good no matter what others might say. Hi Kristin! Glad to hear you are back! Yes, I think there are soup Nazi-types everywhere. Hahaha, wow, you saw the book in the book store on Bainbridge! It’s a good one. His blog posts are also quite good as well, so you should check it out. A lot of great advice on writing and the creative process, in addition to a lot of other interesting ideas too. I must admit that since moving back to SEA, I have yet to goto Bainbridge Island. I keep hearing how great it is, so one of these weekends, I’m definitely going to check it out! I’ll check out his blog for sure! Yes, do go to Bainbridge. The ferry ride alone is such a treat! Now probably should be the time when you can see seals sometimes. I always prefer to go on my own, this way I can hang out at the book store as long as I want, and then I walk over to the gazebo where there is a bakery with a lovely little cafe. In spring, you can sit there under the blossoming cherry trees, it is very picturesque! I loved this post and I think I need to go visit the Grouchy Chef now. It’d be fun to do a food tour of Seattle and see how we score different restaurants on a popular vs. good scale. For example some of the best ethnic food in Seattle is in very unpopular or even hard to find places. A further thought on the idea is about how long the popularity a creator has. We still talk about Mark Twain and Shakespeare. There popularity has lasted decades and centuries. There are plenty of artists that are more popular now than they were in their own lifetimes (Van Gogh, Motzart). Maybe another dimension is *when* your popularity occurs. If your work is good in a deep way, it can last for a long time. Whereas work that is very popular today, but shallow, will be forgotten in a couple of years. Anyway, thanks for the thoughtful post. Made my day. Forgive the typo: it should be “Their popularity” not “There popularity” and “Mozart” not “Motzart”). Sheesh. Hi Scott! Wow, thanks so much for reading and for stopping by! Totally no worries re: typos 🙂 Wanted you to know that I really enjoyed your latest book, and am going to read your other books. As for your Seattle food tour, what a great idea (though I’m not sure the fancy + popular restaurants would appreciate being labeled “overrated” as some of them tend to be.) I agree that there are many terrific gems that are hidden and yet, not very popular (of course “good” being somewhat subjective according to personal taste.) But I suppose as a patron of certain hole-in-wall establishments, I honestly would be a little sad if these places suddenly became all slick and popular b/c then I’d have to wait in line and it would be crowded and I’d have to put up with all the hoopla. So I guess the real food frontier is picking out those “good” places that are still somewhat under the radar, and keeping it a friendly secret. I appreciate your last point about the longevity and timing of good work. I guess much of what I see as popular out in the media today (reality TV shows, for example) are so bad, it’s disheartening. I guess we can all strive towards becoming a Twain or a Mozart, but what sells ads and makes money is reality TV and the Kardashians. That’s why we need folks like you to be both popular AND good/thought-provoking! Thank YOU, you’ve made MY day! 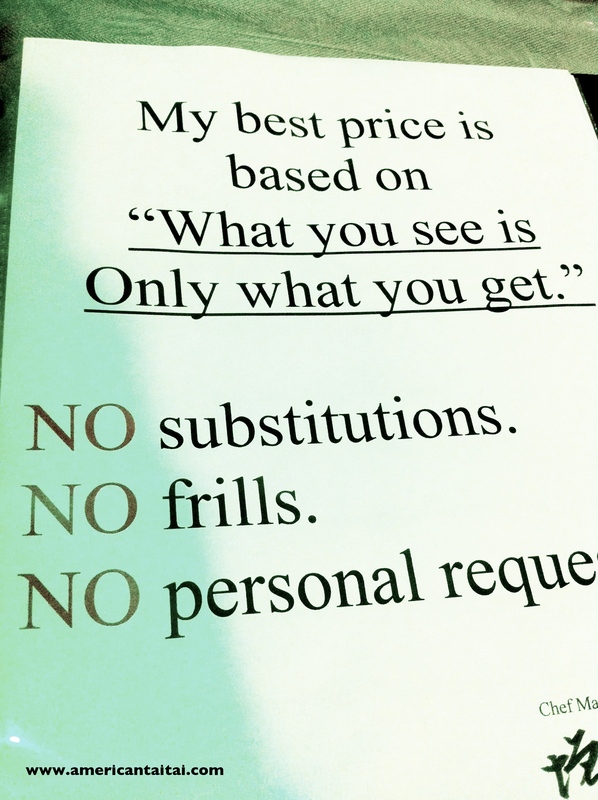 Doh!… now I’ve gone and broken my own rule about good/secret restaurants. Oh well… the Grouchy Chef is definitely worth visiting! I can think of two variations of “good”–that which is pleasing, and that which is right. The first is by definition, popular. The second would be some unknown professor back in the eighties who said “maybe we shouldn’t completely deregulate the banks so quickly.”. He/she was probably not popular but he/she was right, and had a good idea. A better example, Joseph Goldstein and Michael Brown whose research is the foundation of an entire type of drug. But they made no money from it. I learned something new today, thank you for pointing this out! Perhaps this is what happened to Nicolas Cage: was good (Raising Arizona) but then strove for popularity (Con Air) and became very, very bad…. And YES, it was a surprise and a treat to have him stop by! I think you’ll like Scott Berkun’s stuff. You can get a lot of it on his blog/website. This latest book was self-published (Kickstarter, I think) despite the fact that he has an agent and a traditional publisher, but he wanted to learn about self-publishing, which I think is really inspiring. Awesome post and great food for thought, Americantaitai. It seems Seattle is a hotbed for creative thinking, huh? Very cool that the author stopped by to post a comment. Gonna go check out his work now. Thanks for the good book recommendation! This was a fun read, often I think of my own work in this regard… good to know other people are out there processing this stuff. Also, I’ve heard the Grouchy Chef is pretty yummy, what did y’all eat?